You finally scored a spot at a field recording nature workshop. All weekend you recorded tracks of wind, water, and wildlife in the mountains hours from home. Every morning you woke at 4 a.m. and captured hours of dawn chorus field recordings. You let the recorder run all night gathering the sounds of insects and night birds. Your audio recorder is brimming with tracks. And now? What seemed like a good idea at the time now feels like punishment: you’re faced with mastering multiple sessions of eight-hour sound files. 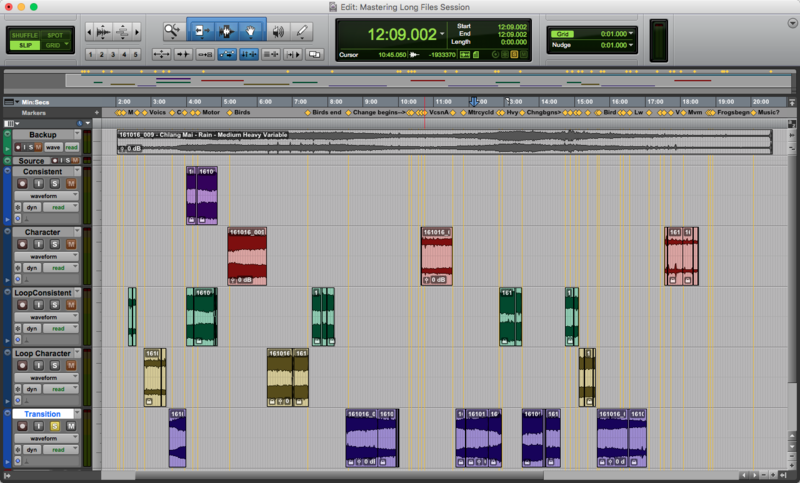 The amount of audio is overwhelming. It will take weeks to complete. Of course, you couldn’t have worked all day and also stayed up all night starting new takes. It’s understandable to just let a digital recorder run for hours. So, it made sense at the time. 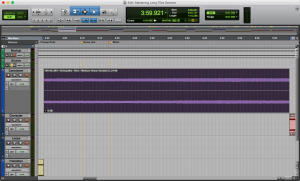 But the problem remains: how do you even begin editing tracks that sprawl for hours? 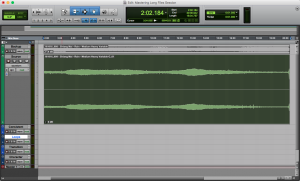 What’s the best way to master hour-long soundscapes into digestible tracks for your listeners? Today’s post is designed to help. I’ll share solutions for solving this problem using a screenshots from editing an prolonged field recording example. 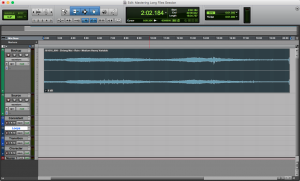 How do hour-long takes end up in mastering sessions? Well, sometimes it is by necessity. It's not always possible to start and stop a recorder with every performance. The most common example is leaving a recorder to capture nature sounds while the recordist sleeps off a long day of work in a tent nearby. It's also common in multi-microphone, multi-perspective sessions. Imagine you are recording smashing rocks in a quarry using microphones at various distances. The close recorder is easy to start and stop with every performance. Perhaps a second recorder is perched on a ledge in the distance. It's just not efficient to scurry up the rocks to reset it with every take. Another reason is cutting anxiety. This happens when you begin recording and don't cut because you are afraid you'll miss a performance. This commonly happens when capturing unpredictable sound effects: it is best to let a recorder roll instead of risking missing the next random peal of thunder. 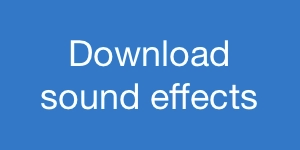 And, the longer you wait, the greater the sound file becomes. 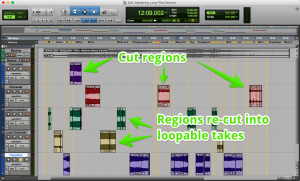 Whichever the case, it's common to return to the studio with extra-long sound files that must be trimmed and clipped into shape. How Do Long Field Recordings Happen? 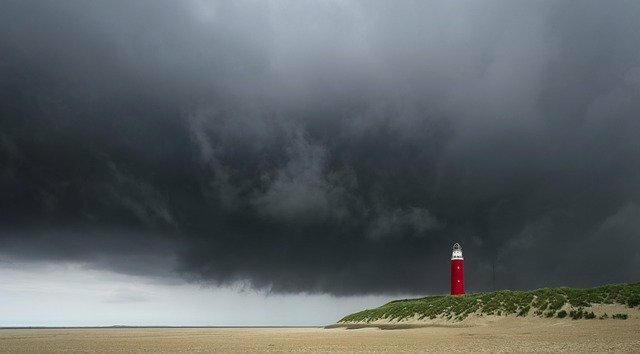 Most of these field recording are ambiences: night-long jungle tracks, evolving rainfall, continuous thunderstorms, a growing dawn chorus, or wave swells that vary in strength over time. Natural atmospheres aren't the only category though. It's common to place a recorder recessed in a vehicle chassis to capture onboard car engine sounds, sometimes for an entire day. Inaccessible recorders contribute long tracks on distant perspective gunshot recordings, too. It can happen when recording any series of specific field recordings if the recorder is too far to be operated with every performance. Technically, thunder peal recordings are actually specific sound effects, too. While they happen in series, they are typically cut and presented individually. Sports crowds are similar. With some exceptions, it's difficult to predict when the next crowd chant will begin. Those takes run for a long time too, since it is wiser to let the recorder continue then cut and miss a random victorious goal cheer. So, what is the problem with long field recordings? Technically? Nothing. Have the sound effects arrived on the recorder successfully? Yes? That’s a victory. The problem is when people want to use them. Long files are difficult to use. Why? First, file sizes are large. Yes, hard drive space is cheap but when that is compounded by many hour-long files, it becomes a problem. Large files are also a hassle to send to other people. Primarily, though, they’re hard to access. Why? Well, no sound editor wants to drop a seven-minute-long atmosphere into their tracks. 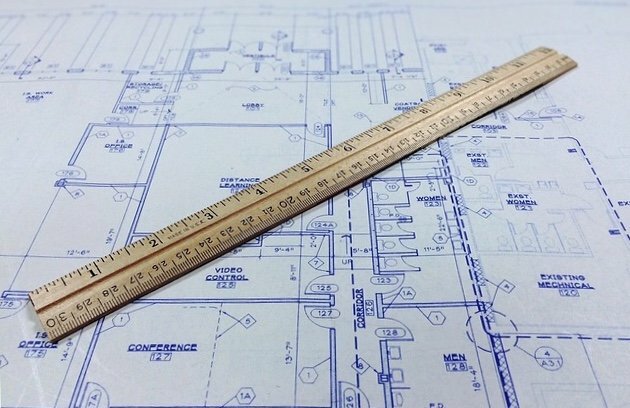 Few project scenes are that long, anyway, so the additional length conveys no benefit. More importantly, an editor doesn’t have time to audition all seven minutes to find the best 30 seconds they need. The additional length creates excess bulk that slows their work and kills creative inertia. This is why long takes need to be divided into separate conceptual sonic chunks to make their decisions easier. On the creative side of things, it also helps focus a sound’s aural expression more tightly. It’s a mastering technician’s job to complete both of these tasks. Note: there are exceptions. Long tracks are appropriate for field recording albums, nature albums, or meditative/new age albums (e.g., yoga studio). 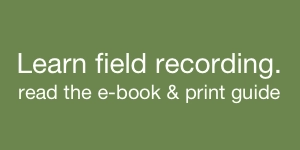 Those field recordings are meant to let a listener experience sound over time. So, it’s okay if they are longer and uncut. 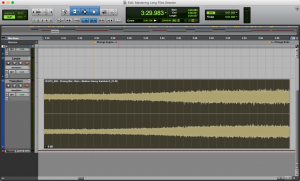 However, today’s post will look at shaping field recordings as an expressive tool for sound editors to use in projects. We’ll look at mastering tricks in a moment. Before that, let’s take a step back and think about how the problem can be prevented in the field. After all, work done on location makes subsequent mastering and curation steps easier. What can be done while field recording to prevent long files? The first solution is to create new takes often. I know, that seems obvious. It’s not so easy, on location, though. 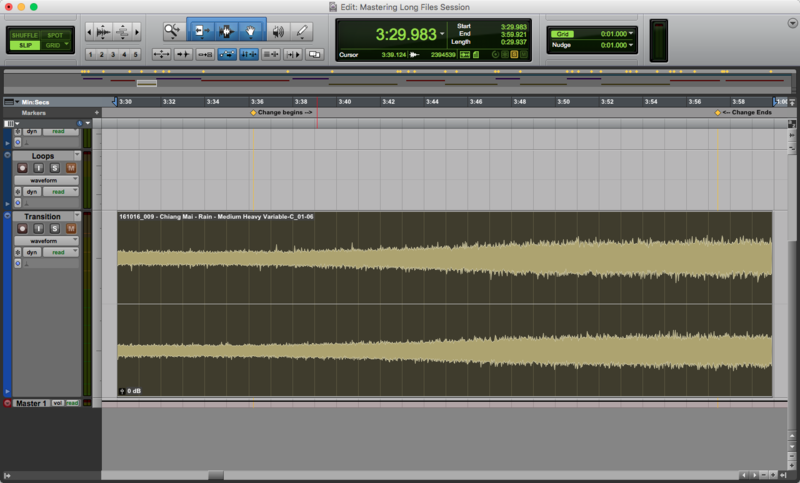 While I enforce a strict time limit on ambience recordings, I often find myself lulled by the sound. 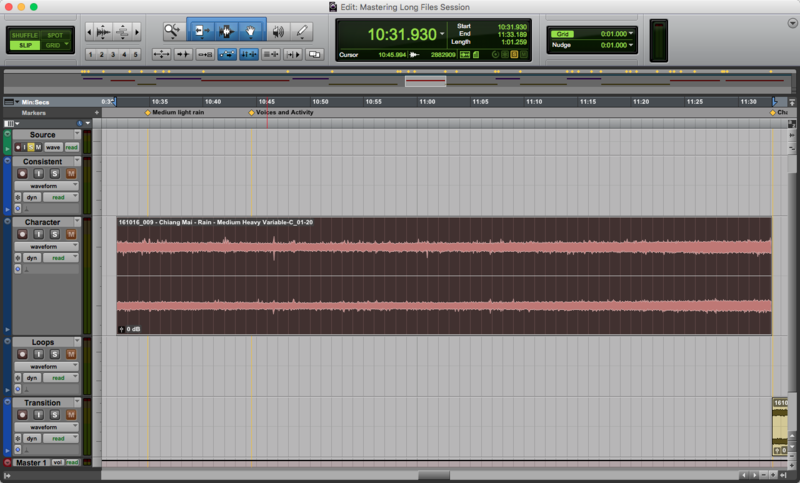 It’s easy to be hypnotized by crashing waves and then realize you’re ten minutes into a recording. Discipline yourself to simply stop a recording and begin it again. 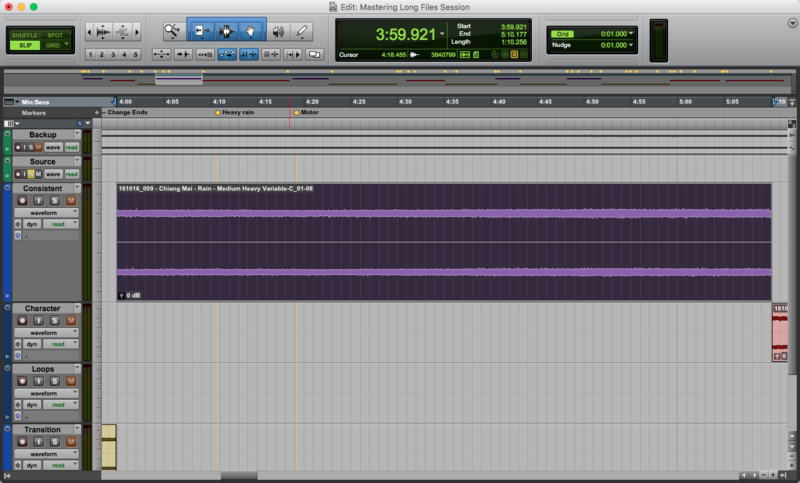 I aim for 3:30-long tracks. Given that some time is lost by slating and editing, that often results in a comfortable length of three minutes or so. That’s more than enough for most film scenes. So, wait for a dip between waves or for birdsong to diminish, then quickly end the recording and begin another. You’ll lose little time, but gain a significant benefit: a separate take from even a similar location and perspective provides a conceptual break when mastering. 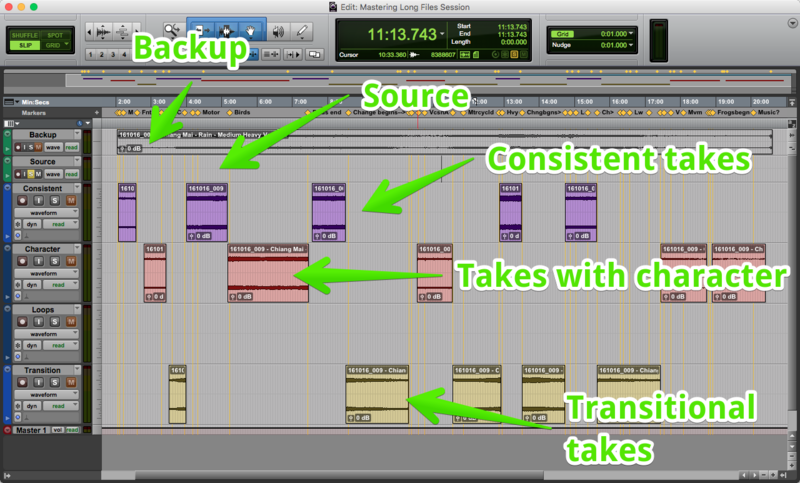 Editing a number of shorter files is psychologically easier to attempt than a long, continual track. The tracks are also more accessible. There’s a clever advantage to this, too: it forces a field recordist to refresh their perspective. The simple act of starting and stopping the take makes the recordist begin listening again. After all, the longer a track rolls, the more a recordist’s attention has a tendency to slip. Starting new tracks often snaps your craft back into reality. This trick also forces a recordist to capture tracks more actively. 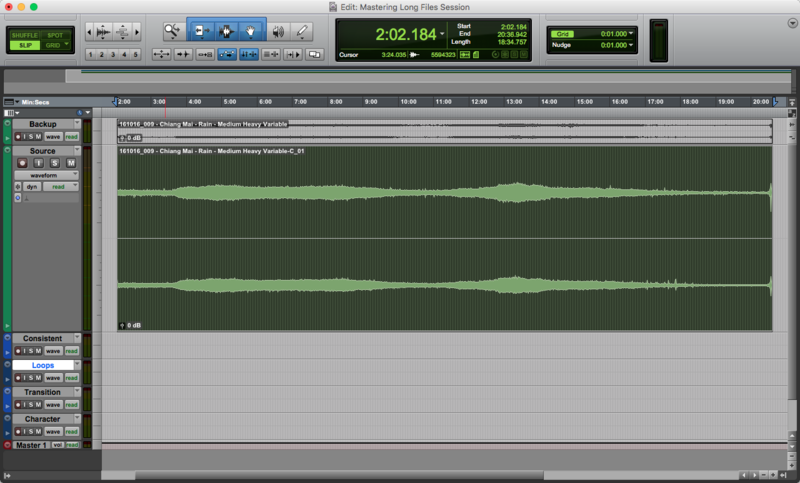 Recording two similar takes doesn’t confer any substantial benefit. 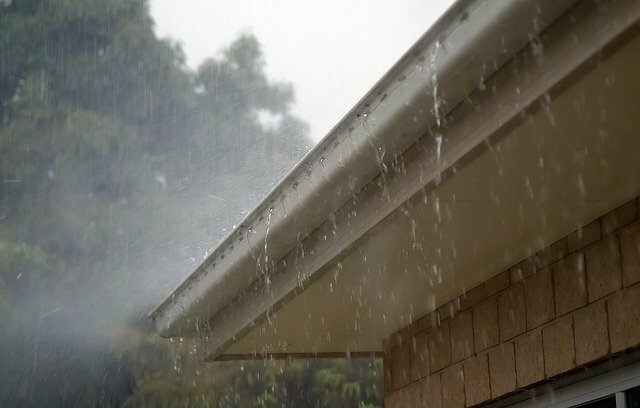 What’s the purpose of two rainfall tracks with the same intensity? That just creates twice the mastering work. It contributes to sound library bloat. 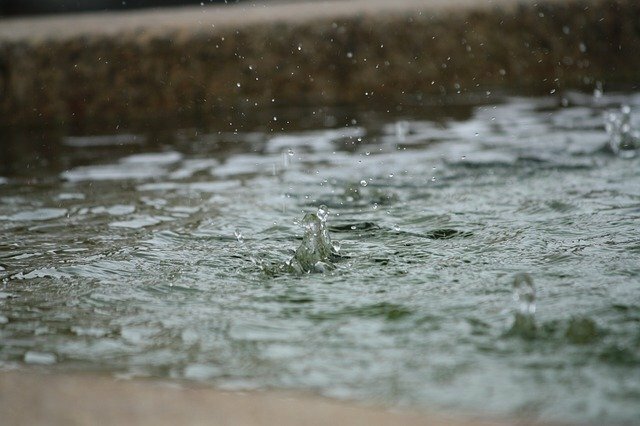 Instead, it’s better to stop the recorder and capture a new variation of the rainfall. Perhaps adjusting the microphone slightly will focus more on drips in puddles. Maybe a new location introduces a drainpipe gurgle. Now, instead of recording a single ten-minute take, you have three separate rainfall field recordings, each with their own character. Since they are shorter, they’ll be easier to master, too. Now, it’s important to note that some tracks benefit from recording continuously. I’ve mentioned many examples above. These special field recordings evolve over time: a dawn chorus, a thunderstorm, a night jungle, and so on. This growth is a vital part of their character, and it is important to capture all of it. We’ll learn how to deal with this in a moment. Aside from that, though, as a general rule, the merit of continuing field recording diminishes after the first three to five minutes. 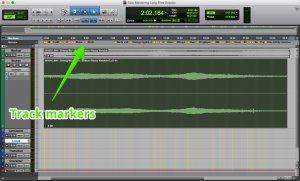 So, how can you tackle mastering these long files? How can you cut a long sound file into reasonable chunks and still retain its expression? I recorded this in Chiang Mai, Thailand. It was a rare moment when traffic had diminished and the birds vanished. It was so unusual to have pure rainfall that I simply let the recorder roll. Which it did, for 18+ minutes. 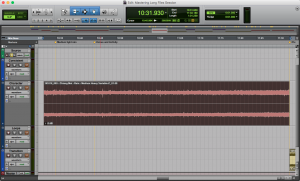 I was delighted at the time, but not as much when I imported the track into Pro Tools. Make a backup copy of sound to another track. Mute it. This will be a reference track. Note: I did a bit of pre-editing RX cleanup, and dropped the repaired file back in place of the original. This included using spectral repair to remove rain drops on the windshield, mic bumps, and dealing with a few wind gusts. Listen to the entire track uninterrupted from beginning to end. 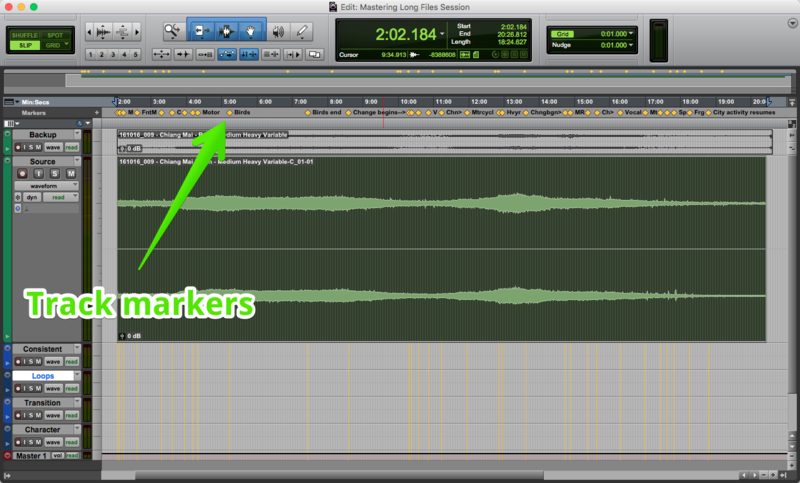 While you do this, drop track markers with notes of the things you hear. Take particular care to note characteristic details or significant changes in the sound of the field recording. Zoom out and look at your markers. You’ll see it has become a blueprint for how to cut the track. The markers will tell you which spans of the long file can safely be divided into their own expression. Consistency: search and separate areas of the track that are consistent. They should not have any distracting character at all. So, the goal is to find steady, constant areas of the track. One example may be heavy, gushing rain. These takes help provide background tracks that will be supporting players for a larger soundtrack. If possible, edit these consistent takes into seamless loops to help your editor friends. Most of the time I’ll choose to make a consistent track a loop as its only version. 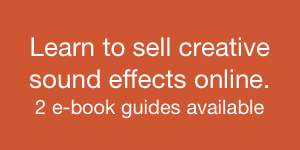 Learn how to make a loopable sound effect. Transitions: find areas of the track that change from one form of expression to another. So, look for areas where the rain grows or diminishes in strength, begins, or ends. These tracks help shape a soundtrack smoothly from one expression to another. They’re extremely valuable, since it is difficult to naturally invent a change from soft rainfall to hard rainfall. This applies to vehicle recording, too. Having consistent takes of 30, 40, and 50 km/h is good. Having the acceleration between them is golden. Character: create a new track that focuses solely on character. For example, in one area the rain splatters may have become prominent. Pull these out into their own ambience. Perhaps a smaller span has a protracted thunder rumble. Split that off as well. 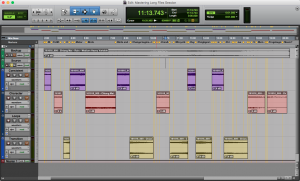 These tracks are used as “boosters” or “sweeteners” that can add colour and character to an editor’s toolbox to supplement the consistent tracks, above. Often these three types of sound effects will overlap. You may find yourself needing part of consistent section to begin or end a transitional take. That’s no problem. Simply grab a copy from the backup duplicate track and edit that, or pull out the handles from a copy of the region in the track. 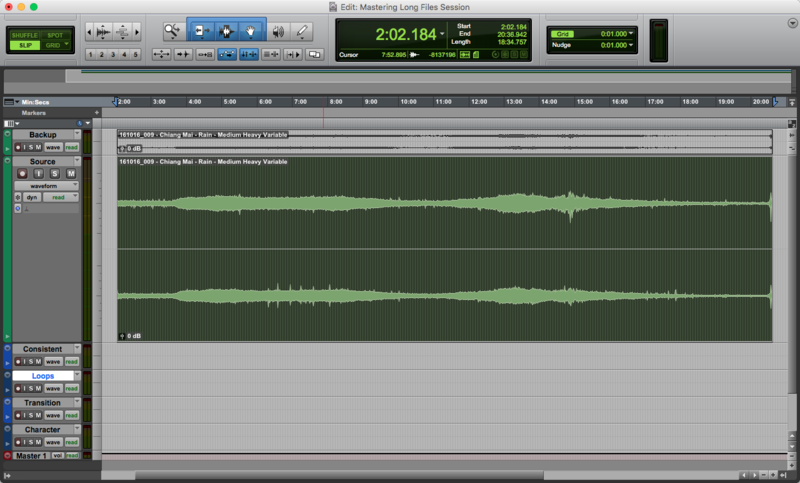 Now that each section has been divided, mastering the long track seems much more manageable, doesn’t it? Focus now on each region or clip. Remove all errors (e.g., moves, thumps, clicks, vocals, wind, etc.). 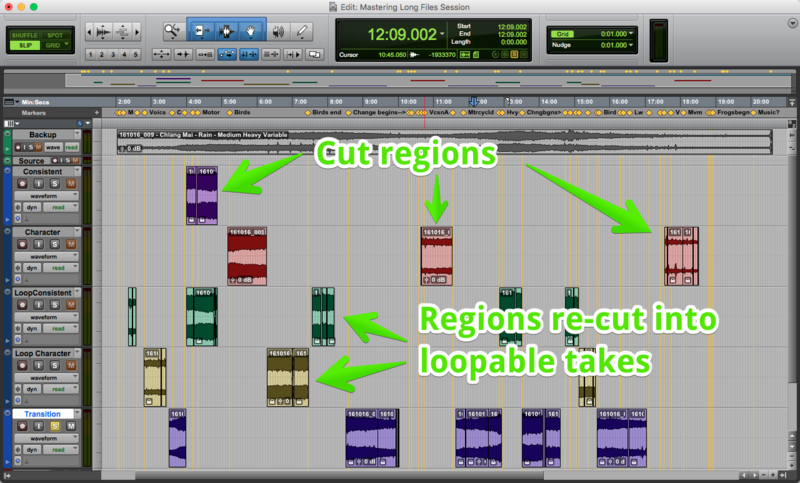 Aim to trim each clip to around three minutes. Don’t be afraid to abandon additional length. As we saw before, after a certain point, it doesn’t particularly matter if a constant heavy rainfall is three or four minutes. It’s best to trim to make it easier for an editor to use. You may find that the character of the long track repeats. Perhaps there are two occasions of heavy rain. Maybe the rain diminished to a trickle twice within 18 minutes. Choose one. Delete the others. Remember, two copies of the same sound don’t help your sound library. Instead, they hurt it by cramming it with identical tracks that slowing searching, auditioning, and sound file selection. 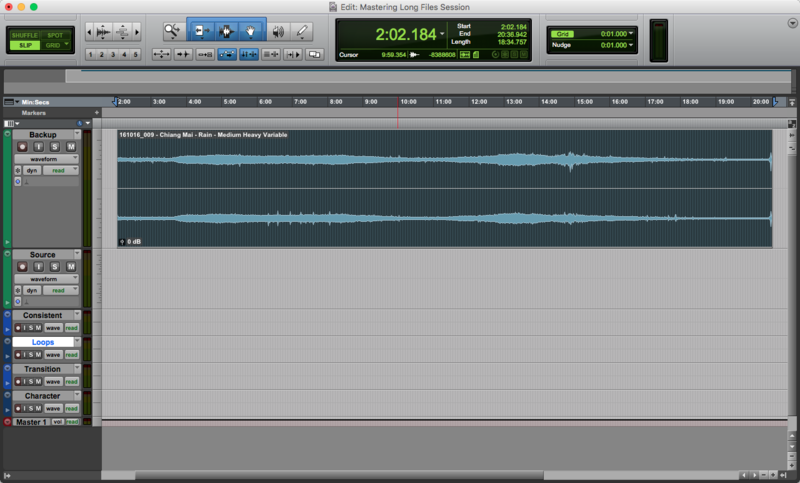 Notice that I looped both the consistent and characteristic takes, and placed them in two new tracks. So, what did we achieve with this technique? 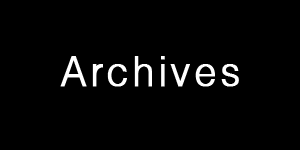 First, we were able to conceptually attack a very long file. 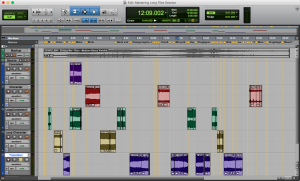 Thinking of a field recording in terms of consistent, characteristic, and transitional sections allowed us to chop a long file into a variety of voices. In the end, we managed to find 16 distinct clips within the single field recording. 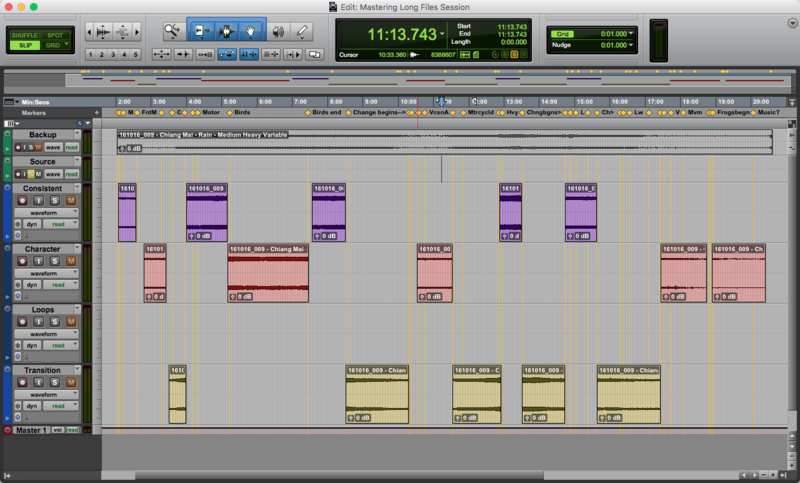 Eighteen minutes of raw material became 16 (+1 loop alt) sound effects. Of course, the tracks are not complete. There are later steps you’ll need to complete: applying names, bouncing a temp file, processing, and committing a final track. 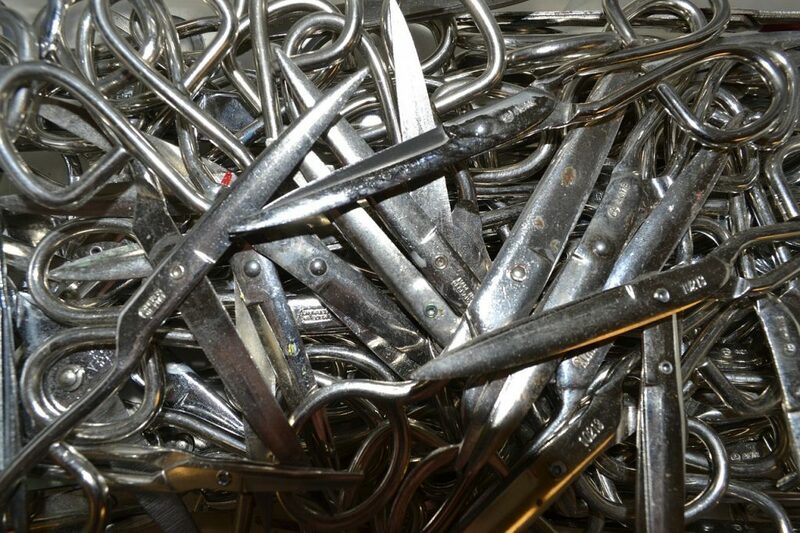 What’s important is that we managed to wrestle with a long, complex file, pin it down, and slice it apart. It allowed us to peer inside a single, long take and think of it differently. It helped us to see a twenty minute field recording not as a stream of burdensome audio, but as an opportunity to pluck out individual notes from within the compositions we hear around us. My thanks to MP for the inspiration for this article.